1800 PSI Electric Pressure Washer is rated 4.7 out of 5 by 174. Rated 1 out of 5 by TSteppy from Poor quality in trigger handle I purchased this in July 2018. Yesterday March 2019 the valve in the trigger assembly failed. I opened the gun up and saw the seam just above the gold threads was leaking water (see figure 1). When I turn on the pressure washer, don't apply any pressure to the trigger, water still blasts out of the nozzle. When I called the parts group they said I needed to order the entire gun assembly vs the ~$3 part is not sold outside of the trigger assembly. Poor durability/quality. I called the service center and they told me the accessories are only a 90 day warranty. I'd have to spend 22$ to fix this. I will no longer purchase Ryobi products because of this experience. Rated 5 out of 5 by Thinkerdavid from As good as a gas-powered washer and easier to use! I bought this washer - as my gas-powered unit is getting old. It is also heavy, noisy and hard to maneuver in tight spaces. I researched this on the Home Depot site, and it had good reviews. I used it for the first time this week, and I actually compared the ease of use and power - side by side - with my Troy-Bilt gas powered washer. 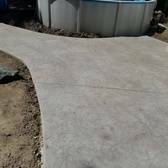 I used it on my concrete driveway, which was very dirty and stained due to being in shade most of the day. The Ryobi unit is fantastic! Powerful, easy to use, and easy to setup up and store at the end of the day. I have yet to use the soap unit, but I like that it is built right in. I highly recommend this unit! Rated 5 out of 5 by thomas1955 from Better than expected wanted something small as I have limited storage area. I was causally looking and researching what i needed for various tasks and by sheer luck, his particular model happened to be on sale, so I ordered it. When it arrived I decided to test it a little and ended up spending a couple hours cleaning my driveway. I was surprised how well it did although it did require a bit of time. A couple days later I cleaned my rear patio and some mildew on my screen house floor. I also cleaned the junk out of the cracks of my brick paver sidewalk. Haven't used it to clean my cars or house siding yet. I'm very curious as to how well it will clean the stubborn areas on my gas grill. Rated 5 out of 5 by Dad Rokz from Great Pressure Washer I did a lot of research before I made this pressure washer purchase. I wanted something that was light and mobile yet delivered the high pressure I needed for multiple tasks. The primary reason for the purchase was to wash cars with my attached foam cannon, which it does a great job worth. My other pressure washer would fall over constantly. With this one, its wide stance and low center of gravity prevent that from happening. The well designed built in wand holder, nozzle holders, and cord strap make this a compact easy transportable unit. I would purchase this again, actually I bought and gave one to my son for X-mas for their new house they just purchased. Its a great unit. Rated 4 out of 5 by xzxzxz from Nice unit, but two complaints. The unit does a good job. My two complaints are: 1) The unit should come with a small sample of the soap you have to use and the additive you need to use. I get the unit home and open it to use it, and find out that I need special soap and an additive to be use after I have used the pressure washer. Guys small samples would have been nice. I had to drive 10 miles + just to use the device for the first time. 2) The nozzle to use with soap is very low pressure. I will need to buy a more powerful nozzle made to use with soap. Otherwise the Washer did a good job on my siding. Rated 5 out of 5 by beachCM from So far so good I just purchased this pressure washer and I am pleased with the options it has. I have only used it once, but the low pressure soap option worked as did the high pressure option. High pressure really took off the dirt on the patio. Rated 5 out of 5 by Marrrk from Perfect size and functionality I bought the Ryobi to replace a 2300 psi (gas-powered) washer that had broken down. Instead of paying $100 to repair the old washer, I paid a little more and got a new, very functional sprayer that does all that I need. At 1800 psi, it isn't as powerful as my old unit, but the portability, ease of setup and use is much more important to me. The Ryobi is light and has plenty of power to clean my siding, gutters and back yard deck. I'm very happy with this purchase and would recommend it to anybody that has some light to medium power washing needs. This RYOBI 1800 PSI Electric Pressure Washer is lightweight and compact, making it easy and comfortable to move around your house. With its powerful 13 Amp electric motor, this unit delivers 1800 PSI of force for quick cleaning of things like windows, decks, and patio furniture. Featuring a durable roll-cage frame, this unit is designed for easy transport. The on-board detergent tank offers hassle-free cleaning, eliminating the need to drag around a bucket and hose behind you. There is no need to try and keep track with the three included nozzles, as they can be conveniently stored right on the unit. 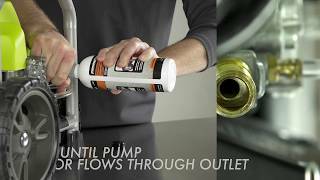 Use the included Turbo Nozzle for up to 50% more cleaning power. 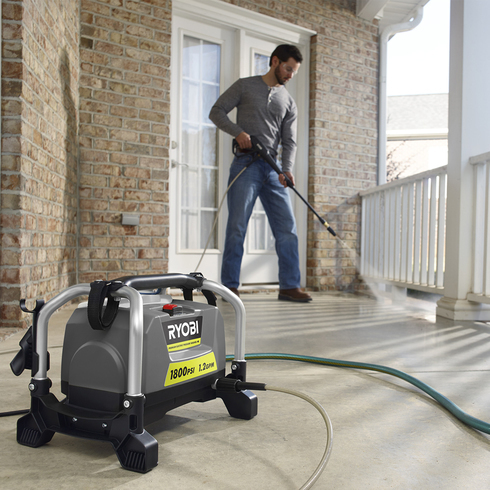 The RYOBI 1800 PSI Pressure Washer is backed by a 3-Year Limited Warranty.